That twirling osprey joins a host of other swinging animals in this counting jamboree. By the time ten flamingos go tango, the dance floor expands in a special foldout with 55 animals rocking away! Arthur Dorros’s playful verse and Caldecott Medal winner Emily Arnold McCully’s boisterous characters dance right off the page and will have you twirling on your toes in no time! Wiggle wiggle, wobble wobble, tap tap tap. One of my sisters told me years ago, “You can’t dance.” But I decided I could not, would not, stop dancing. So I kept moving with the music as best I could. Later, with good partners, I even won a couple of dance contests, at least I think I did. Dancing is fun! I saw people dancing the tango in Argentina, and also saw flamingos strut their stuff there. 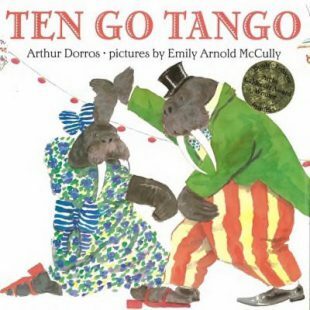 It took quite awhile for those experiences to spin to the surface in TEN GO TANGO, but after awhile everything was hopping-one step after another, slide and twirl, with lively whirling illustrations, soon fifty-five animals were dancing through this book.